Most of us have been on both sides of the drama of bad guest-and-host relationships. Though sometimes of epic proportions, these dramas are often quite petty. At night in the one bathroom, we have wondered if it is ruder to flush or not to flush the toilet. We have groaned at the snoring from down the hall, and we have snored. The scenarios are endless. The drama of guest-host relationships is part of our culture. It plays out—often in extreme ways—in our fairytales and myths. No, don’t enter that little gingerbread house, the witch inside will try to bake you. That hobo might be a god in disguise, ready to punish or reward you for the quality of your air mattress, the taste of your meal. Take The Odyssey. In a way, it can be read as a catalogue of good and bad hosts and guests. Focusing on the bad ones (more interesting), we have hosts who won’t let their guests leave (Circe) or try to eat them (Cyclops), and we have guests who overstay their welcome and want the house and its wife for themselves (the suitors). Of course, if you interviewed all of these bad hosts and guests, they would have their own diatribe on Odysseus as a terrible, entitled guest and Penelope as the moody, flirtatious hostess. Whether he had this cultural baggage in some recess of his mind or he knew from personal experience, architect Richard Neutra designed the perfect house for maintaining good relations between guests and hosts. 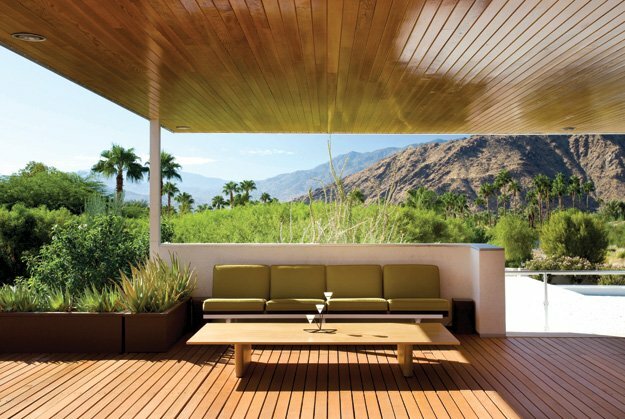 In the mid-1940s, Edgar and Liliane Kaufmann, the owners of Frank Lloyd Wright’s Fallingwater, approached Neutra to design a desert house in Palm Springs, CA. Their kids were grown; they were millionaires (made rich by their chain of department stores on the East coast); this house would be one of several: so the Kaufmanns were able to specify that they wanted a “vacation house” for a two-to-three-month stay each winter where they could entertain guests. Neutra, quite the socialite himself, realized having both communal and private space would be essential. In order for hosts and guests to not eventually drive each other insane, both parties would need control over enjoying and retreating from each other’s company. This “four-courter plan” afforded different occupants their own private spaces: to the north, lies the guest wing (with its own privacy within its overall privacy, two separate bathrooms and personal patios); to the west, the staff’s wing; and to the east, the hosts’ wing. The south wing provides a prolonged covered walkway, divided between front and service entrances. These wings join to create what Neutra playfully called the house’s “public square,” the most communal of the spaces, the living room. In place of the piazza’s central fountain is a commanding, ashlar hearth. To add to the intimacy of this hearth, Neutra lowered the white ceiling in the living room by about a foot. Hungry? Adjoining the living room is the dining room. It shares the hearth, but instead of a view of the fire lit within, you have a heightened view of the hearth’s dry-set (mortared from behind) “Utaf buff” stone. Kaufmann flew in the same masons that Neutra, as one of Frank Lloyd Wright’s assistants, had trained at Fallingwater. These masons were highly skilled in a waning craft. As art historian Barbara Lamprecht writes, “Each stone was chiseled to fit its own asymmetric place.”2 Throughout the house but in the dining room especially, the stone provides a visual and tactile contrast with the smooth finish of the wooden dining room table and ceiling, as well as the polished concrete floors. Where the stone seems to absorb the light, the floors and ceilings reflect it. Done with your food? In Neutra’s design, the staff, whose wing (of the pinwheel) connects to the dining room, could easily serve, then whisk away meals. Feel like a millionaire’s guest yet? Perhaps, it’s time to go see the Picassos and Cézannes in the gallery beyond the hearth, also located in the pinwheel’s center. As avid patrons of the arts, the Kaufmanns needed a place to showcase their art collection. By placing this gallery in this central social space, Neutra invited the guests to view the artwork while also, through positioning the windows and the room itself to the north, keeping the area shielded from the strongest sun. But in a way, the exterior grounds are also a kind of gallery, showcasing an array of desert flora (including a Joshua tree, an organ pipe cactus, an ocotillo, and agaves, among many others) and massive, sculptural boulders. The nearby pool area, accessed through the living room, also becomes a backdrop for more of the Kaufmanns’ art. In photographs of the original house, a bronze sculpture of two fluid interlocking people reflects in the turquoise water during the day and is illuminated by moonlight and buried lights at night. This pool area also easily becomes linked to the central communal area; the plate-glass windows between the southeast corner of the living room and the pool are on sliders and can be whisked away. Where are Gatsby and Daisy, Nick Carraway and Jordan Baker? By day, by night, their likenesses drape themselves around the pool. Neutra circulated ice water on the swimming pool decks to keep the poolside bearable during the hottest parts of the day. And when the temperature drops at night (this is the desert after all), radiant heat in the low seating wall keeps the party going. 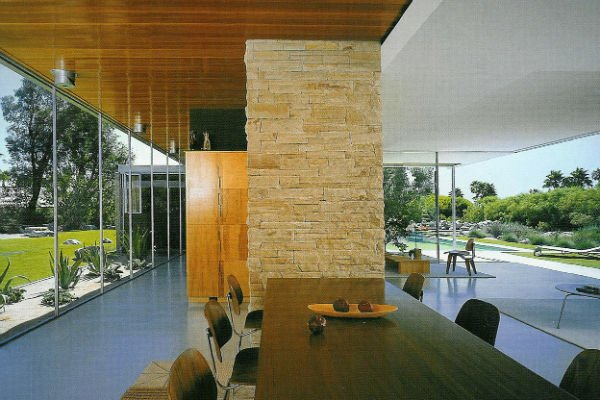 Inside, Neutra also used radiant heat throughout the flooring of the house. Is it stuffy in here? Another key element to living comfortably—and stylishly—in the desert is good air ventilation. The pinwheel structure allows for optimal cross-ventilation in the central hub area. Shall we get rid of the walls and windows? The sliding plate-glass windows (the size of walls) throughout the house—in the guest bedrooms, the master bedroom, and the living room—speedily remove divisions between indoor and outdoor space. Another aesthetic as well as practical leitmotif of this desert house are the vertical, aluminum louvers that line the western side of the guest patio and “the gloriette,” a rooftop space above the dining and living room. Neutra invented these adjustable louvers so that they could contend with the desert winds and sandstorms, and, on more climactically peaceful days, allow visibility and air circulation. The shaded walkways in all wings of the house also provide some protection from the elements while keeping the space open. The desert is a dramatic place. Sun, wind, sandstorms, extreme temperature drops. In addition to vying with all these natural forces, Neutra had to take into account the winter monsoon. In a typical melding of the technological with the aesthetic, Neutra created southern gutters off of the master bedroom that narrow toward the end, causing the rainwater to flow east onto carefully placed boulders (a common motif in Japanese gardens). Here, as in many places throughout the house, the manmade (gutters) fuses with the natural (boulders). Okay, one more chic feature before I, your virtual host, kick you out of this house. What’s with all the silver? Anyone else pick up on the Stanley Kubrick-2001: A Space Odyssey-feel of the place? 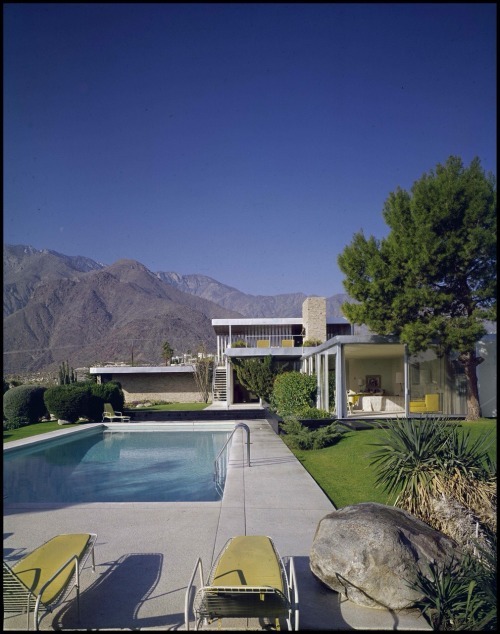 I know it’s in part from all the plush yellow cushions inside the house and by the pool area in some of the original, iconic 1947 photos by Julius Shulman. But the retro-futuristic feel is also due to the rampant use of silver: silver in the steel fascia, the window framing, and the 37 total feet of aluminum louvers. Though I agree that this “reduc[tion] [of] an element’s visual impact” or dematerialization supports Neutra’s overarching aesthetic of “nature near” and “building with nature”4 and that in the Kaufmann house the horizontal silver fascia as well as their silver supporting columns dematerialize and lighten the overall structure, deflecting one’s attention onto the landscape, I would also argue that the silver highlights the artificiality of the building. It is important to realize—before you go—that Neutra was deeply influenced by the Modernist machine-aesthetic. Like many of his European mentors—Adolf Loos, Erich Mendelsohn, and Le Corbusier, among others—Neutra lauded America’s industrial buildings as being free of the trappings, the “ornament,” of architectural tradition. At this point in history, an excitement in industry and nature was not necessarily considered contradictory. One sees this paradox in Le Corbusier’s “Five Points of a New Architecture” when he asserts that “the roof gardens” that “help protect the reinforced concrete from changing temperatures” will, with “their luxuriant vegetation,” be “the most favoured place in the building.”8 Le Corbusier perceives no disjunct between concrete and garden. Similarly, throughout the Kaufmann House, Neutra “build[s] with nature.” Of note is the front entrance walkway, where weeds grow in the broken pavers, creating a sensual rhythm of slim, soft, multi-surfaced (tendriled) green and large, hard, smooth white. Another striking natural and built area exists by the master bedroom: a tree is almost contained by the extended roof; its branches reach out from underneath. In such architectural details, as well as the overall design, Neutra uses the flowing landscape to offset the building’s orthogonals. I know it’s hard to leave this moonscape. You wish, as the guest, to be the host. Perhaps part of the stepping-on-toes phenomenon/problem with guest-and-host relationships lies in the contradictory and fraught etymology of the words. The etymology of “host” (Old French hoste) once included “guest.” I think this inclusion relates to the interdependency of each: hospitality (from Latin hospitem) is a two-way street, a host isn’t a host without a guest, and vice versa. And, as we know from our literature, there have been some terrible hosts who lorded over their position of power; thus a “host” literally means the “lord of strangers” (from ghostis in Proto-Indo-European (PIE)). But, on a host’s behalf, look at the use of the term in biology (the earliest recording is in 1857 (two years before the publication of Darwin’s Origin of Species)): a parasite needs a host. And remember that in Old English, “guest” includes “enemy” (gaest, giest)—though it is true that “host” has a similar reflection: in Latin hostis (“enemy”) is a cognate of hospes (“host”). But this mirroring between the words is appropriate. If you think about it, there is an equal danger for both guests and hosts. A guest may loot, while a host may entrap. Both are strangers, as the root of “xenophobia” suggests: xenos of Greek origin includes “guest, host, stranger.”11 Guests and hosts are strangers made intimate by a home. Next time you are caught on either end of guest-host relations, think of the Kaufmann Desert House and how nice it would be to have your own wing as well as that ashlar fireplace to stare into as you enjoy another’s company. 1. Several of Neutra’s predecessors used pinwheel designs. Chief influences were Frank Lloyd Wright’s pinwheel designs and L-shaped Usonian houses (1/4 a pinwheel, if you will) and Mies van der Rohe’s Project for a Brick Villa, 1923. 2. Barbara Lamprecht, Richard Neutra, 1892-1970: Survival through Design, (Köln: Taschen, 2004) 60. 3. Barbara Lamprecht, Richard Neutra: Complete Works, (Köln: Taschen, 2010) 34. 4. These phrases refer to two titles of Richard Neutra’s books: Building With Nature. (New York: Universe Books, 1971) and Nature Near: The Late Essays of Richard Neutra, edited by William Marlin (Santa Barbara, CA: Capra Press, 1989). 5. Also unlike Frank Lloyd Wright, Neutra often exposed materials, such as concrete, steel, and aluminum. Frank Lloyd Wright originally wanted to cover the concrete—which he dismissed as “conglomera” and an inferior material—in Falling Water with gold leaf. Luckily, Kaufmann dissuaded Wright from doing so. Afterward, Wright came up with still another solution to fix the concrete: he proposed applying a coat of apricot paint as a finish. See Kenneth Frampton and Yukio Futagawa, Modern Architecture 1920–1945, (New York: Rizzoli, 1983) 398. 6. Richard Joseph Neutra. 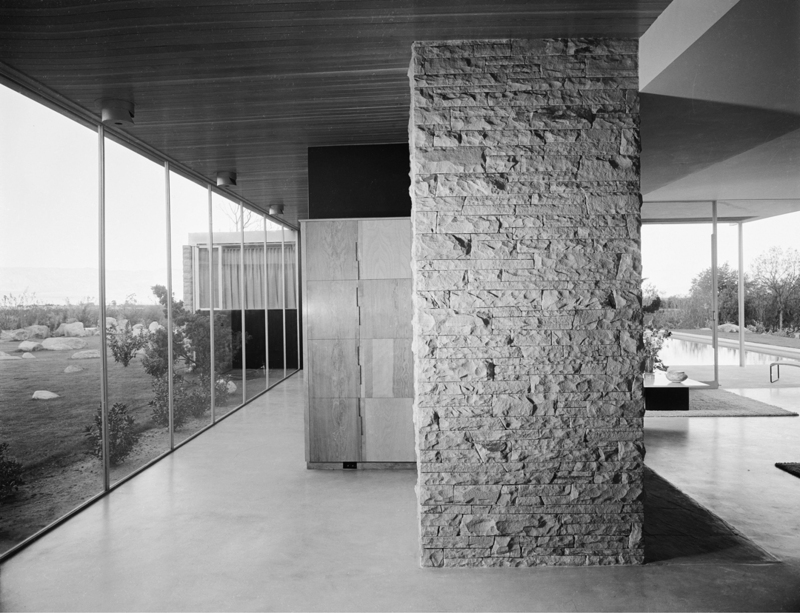 Kaufmann “Desert House,” Palm Springs, CA, 1946. Tremaine “House in Montecito,” Santa Barbara, California. 1948, Global Architecture 8, edited and photographed by Yukio Futagawa, text by Dion Neutra, (Tokyo: A.D.A. EDITA, 1971) 7. 8. Le Corbusier, “Five Points Towards a New Architecture,” in Programs and Manifestoes on 20th-century Architecture, edited by Ulrich Conrads, (Boston: MIT Press, 1970). 10. Neutra, Kaufmann “Desert House”…, 7. 11. Douglas Harper, Dictionary.com, Online Etymology Dictionary, http://dictionary.reference.com/browse/. Please Also Note: All of the linked images in this article are to Julius Shulman’s photos of the Kaufmann house. I also highly recommend looking at Yukio Futugawa’s photos of the house in the Global Architecture series mentioned in the endnotes. Nicola Fucigna is an editor-in-chief of Construction. She works for Rowell Brokaw Architects in Eugene, Oregon. She has an M.Arch from the University of Oregon and an M.F.A. in poetry from the University of Arizona. Her literary work has appeared in Camas: the Nature of the West, Capitalism Nature Socialism, The Nervous Breakdown, The Country Dog Review, and The Portland Fiction Project.